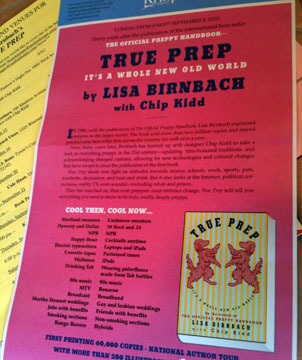 We have follow-ups to two topics we initially covered last week, J. Crew’s fall line and True Prep, the new book from one of the TOPH (The Original Preppy Handbook) authors, Lisa Birnbach. Friday’s post on Crew’s fall line offered a number of photos but little editorial blather from either the professionals in the trade, or your utterly unprofessional hostess here at Princess InterGalactic HQ. ““Preppy” style is often mentioned in the same breath as J.Crew. Is today’s preppy different from yesterday’s? It remains to be seen if Ms. Lyons will continue the move away from ‘preppy’ toward trendier pieces, or if the brand will retain some of its more traditional styles. “… models wore rugged tweeds, textured tights, and outerwear with Mongolian lamb accents. J.Crew creative director Jenna Lyons described the look as “Edie Beale goes to Girl Scout camp.” The saucer-sized jewelry and homemade headpieces would definitely be at home in Grey Gardens, and Lyons suggested “slapping brooches all over everything” to achieve this eccentric, layered look. Most of the men’s styles we saw looked quite stylish. 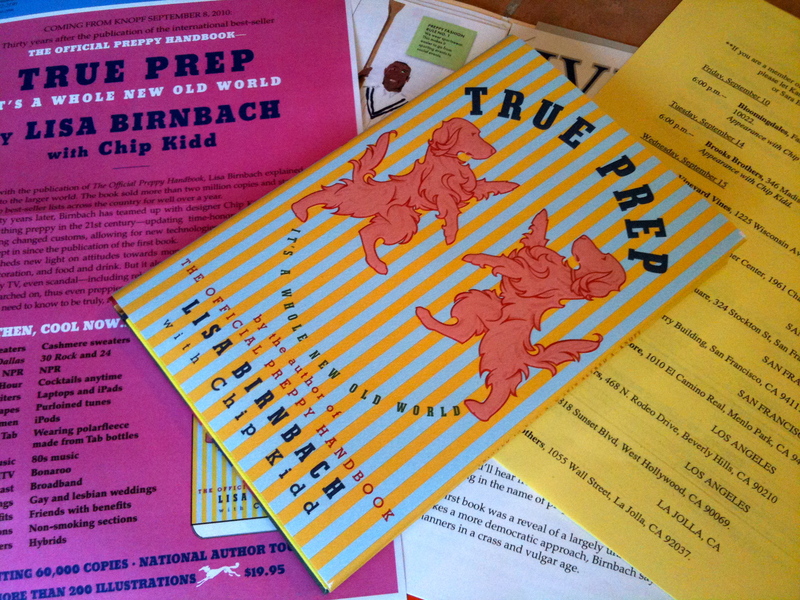 Our other topic with some life to it, True Prep, first discussed here. An interesting connection to the story above: the new book has multiple references to Crew: in just one diagram the man is described as wearing “J. Crew Head-to-Ankle,” the woman’s striped shirt and khakis are by Crew, and she is carrying a J. Crew handbag. As previously mentioned, a good portion of the new book deals with the impact of technology and things like cell phones, while also updating style trends. Sunday’s Easter dinner was quite a gala, TQM graced us with her presence and we were off to the Consort’s ancestral home to visit with scads of other relatives. We close with an Adventure in Argyle, compliments of our hostess for the dinner extravaganza, the Consort’s mother. 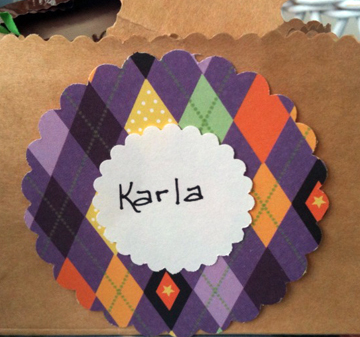 Not only is she an amazing cook, look at the place cards she created for everyone!